As Head of Education, my goal is to welcome all audiences—from babies to centennials!—to the Worcester Art Museum where they can experience the joy of being in the presence of great art. To support this goal, we decided to create Touch Carts (inspired by similar carts at the Virginia Museum of Fine Art) where kids can learn about as well as experience first-hand what happens if you touch art made of wood, metal, stone, or other materials. We chose Helmutt, our kid-friendly dog to share tips about what you can and can’t touch. 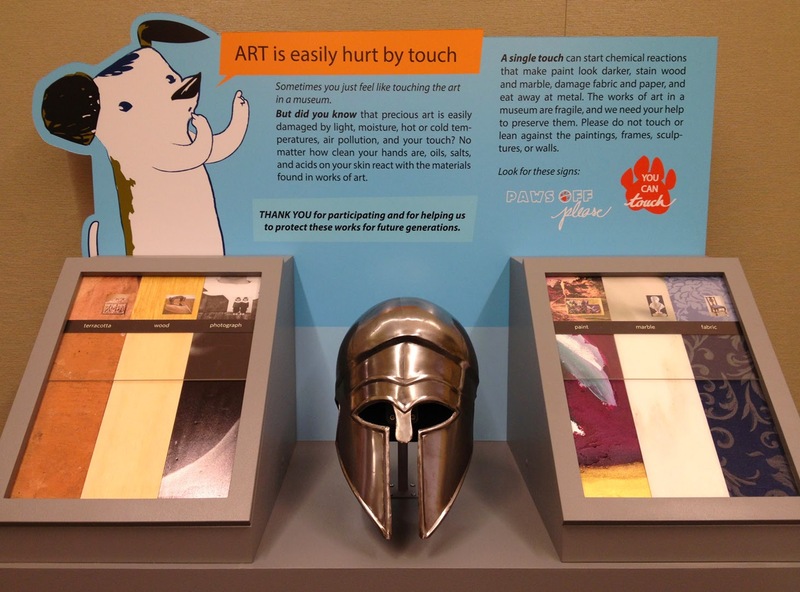 Yes, there are things in the art museum that you CAN touch—check out Helmutt’s own house, as well as the touch objects and interactive iPads in the Knights exhibition. The Touch Carts are now on the floor at the entrances to the museum. Bring your kids and try them out. We all need gentle reminders about how to protect our art, so everyone—now and in the future—can get inspired, over and over again. Ask for Helmutt’s family guide to the Museum at the Visitor Services desk, and look for Helmutt’s paw prints in the galleries. We hope you’ll bring your kids back soon to discover where Helmutt will pop up next!